Located in the pulse of Jakarta’s Central Business District, experience AYANA’s legendary hospitality in rooms and suites designed to impress. The AYANA Suite is the very height of modern luxury and features a separate living area, dining room and kitchen to enhance overall quality of stay. Enjoy the comfort of your own suite with exquisite marble bathroom, stylish living area, complimentary mini-bar and signature amenities. Studio ExecutiveSuites present the perfect introductory opportunity to experience the signature touch of AYANA's luxury amenities and services. When second best just won't do, One Bedroom Executive Suite offer the lavish comfort of separate living and service kitchenette areas. Rooms provide comfort and flexibility with king or twin beds, a stunning marble bathroom and garden or city center views. A top choice for all of your business getaway needs in Jakarta, Deluxe Rooms offer a select number of private terraces overlooking Jakarta's mesmerizing cityscape. Premier Rooms are blessed with stunning city center views and an abundance of natural sunlight due to their strategic, higher floor location. Jakarta's top pick for business travelers in the heart of Jakarta's CBD, upgraded with the benefits of Executive Lounge access. Designed to complement Jakarta’s most stylish private business center, enjoy sumptuous cuisine and sophisticated cocktails in a relaxed and elegant setting. Wherever you may be flying in from, whether it’s Bandung, Hong Kong or Sydney; you can count on AYANA Executive Lounge for all of your executive needs. Offered complimentary to all of AYANA Executive guests; the Executive Lounge provides a hip sanctuary to enjoy a complimentary gourmet breakfast, relaxing afternoon tea and evening cocktails. 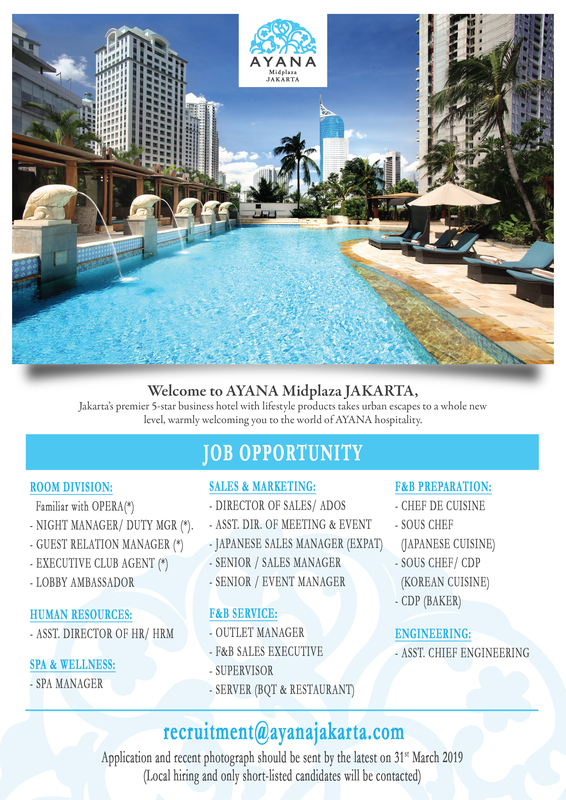 Designed for Jakarta’s discerning business clients, AYANA Suites are the crown jewel of AYANA’s luxury accommodations. When second best just won’t do, One Bedroom Executive Suite offer the lavish comfort of separate living and service kitchenette areas. Studio Executive Suites present the perfect introductory opportunity to experience the signature touch of AYANA’s luxury amenities and services. A top choice for all of your business getaway needs in Jakarta, Deluxe Rooms offer a select number of private terraces overlooking Jakarta’s mesmerizing cityscape. Jakarta’s top pick for business travelers in the heart of Jakarta’s CBD, upgraded with the benefits of Executive Lounge access. Wherever you may be flying in from, whether it’s Bandung, Hong Kong or Sydney; you can count on AYANA Executive Lounge for all of your executive needs. Offered complimentary to all of AYANA Executive guests; the Executive Lounge provides a hip sanctuary to enjoy a complimentary gourmet breakfast and evening cocktails.